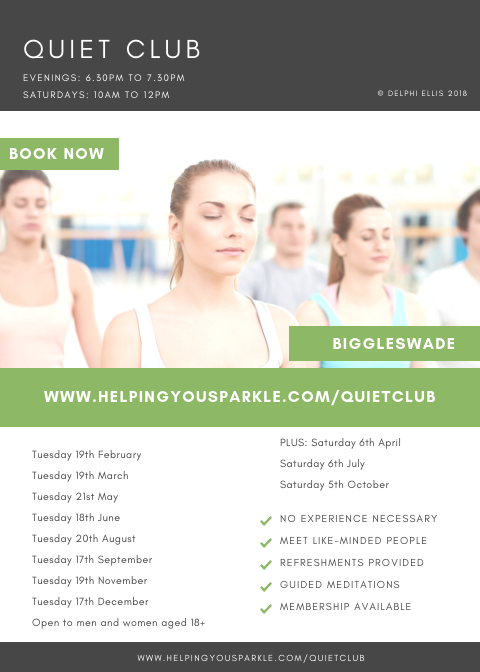 Quiet Club is a monthly meditation group which offers the opportunity for peaceful contemplation through mindfulness. There are 1 hour and 2 hour sessions available, depending on your location. When you arrive you’ll receive a warm welcome, with refreshments provided. There will be an opportunity for brief introductions, then time to sit and enjoy peaceful surroundings, and a mindfulness meditation activity, which focuses on creating inner stillness. The “club” is open to men and women, aged 18+, and lasts approximately an hour for evening clubs, or two hours for Saturday mornings, where applicable. No previous experience necessary. There are clubs currently in Milton Keynes and Biggleswade. Please note these dates are subject tot change. To sign up for updates about Quiet Club click here. First time at Quiet Club? Ask about discounts.